After months of preparation our client, Implement Consulting Group (DK) launched their new Digital Workplace on March 9th 2018 for more than 750 employees based in offices in Denmark, Sweden, Norway and Switzerland. The new solution is built in the cloud based on the Microsoft Office 365 platform, using Epona DMSforSharepoint and Office Groups. Epona has been collaborating with Blue Dock, Numeric and Wizdom to build the new solution. 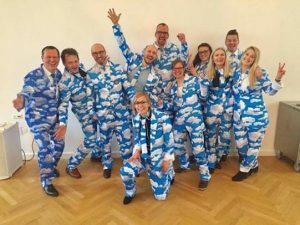 In order to emphasize the launch, the core project team put on their best “cloud” suits and to ensure a smooth transition to the new ways of working, we used Implements own experts within the field of Change Communication and Gamification.